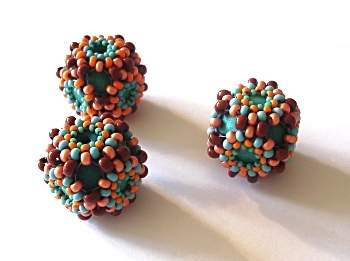 These beaded beads are part of my Honeycomb Beadwork series that is based on joining identical motifs together. For these beads, five motifs are beaded and joined into a cup shape. A painted, wooden bead is placed inside and a sixth motif is added, joining to all the previous ones as you go. Once I knew the design worked, I beaded many samples using different beads and played around with colour placement to change the look. These three examples use exactly the same beads, I have just swapped the placement of two of the size 11s which makes them look so different. Once I had made some individual beads I moved on to coming up with finished pieces of jewellery that use them. Instructions for these beads are contained within my Honeycomb Beadwork instructions.